With SONAR Trend Platform Reply is able to create an overview and mapping of relevant trends in the field of Artificial Intelligence, based on their occurrence within expert media articles, mass media, patents and scientific publications. Find out more fom Reply's survey on current developments in Artifical Intelligence! Artificial Intelligence has recently experienced a real boom in the interests of companies. With the advent of modern deep learning, we have gained a real insight into Ai-driven technologies in practice: from the creation of medical diagnoses, the identification of criminals in crowds to autonomous driving. But the history of AI began earlier than you might think. 1950 Artificial Intelligence is not yet an independent field of research, but the Turing Test has already been invented. This concept was developed to test whether an AI system has the same ability to think like a human being. 1956 The groundwork for the establishment of the research discipline Artificial Intelligence is laid at the Dartmouth Conference. During the event computer scientist John McCarthy coined the term Artificial Intelligence. 19602000 Between the 1960s and the end of the 1990s, Artificial Intelligence experienced several boom and low phases. Among the highlights were the introduction of the chatbot Eliza in 1966 and a game of chess in 1997 that IBM's DeepBlue won against the then world chess champion. 2011 The prospects of AI become tangible as IBM Watson wins "Jeopardy" and the digital assistants Siri (2011), Google Now (2012) and Cortana (2014) are introduced successively. 2012 Google Brain is in a development stage that allows the AI system to recognize the image of a cat. 2014 Google Brain leaps a big step further and is already able to describe a scene in an image. 2016 The media attention for the topic AI increases. One of the most noticed events in 2016 is the presentation of Tay, an Artificial Intelligence that can post tweets. In no time she moved on to posting inappropriate words and images. 2017 The year before, DeepMind's AlphaGo managed to beat the Go champion. By 2017, the system is ready to teach itself Go. 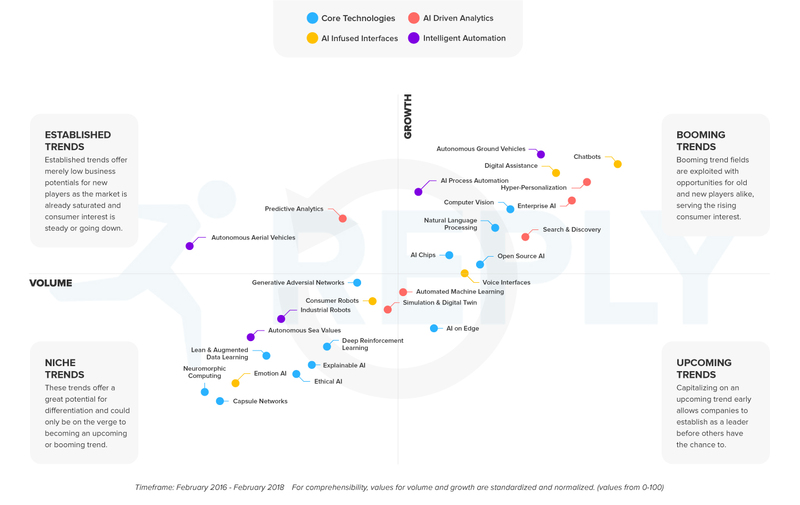 2018 AI-based technologies are on their way to attracting more interest than smartphones. "In the long run, we are evolving from a ‘Mobile-first’ to an ‘AI-first’ world”, says Sundar Pichai, CEO of Google. Artificial Intelligence is the Game Changer of our time. It mainly is driven by all trending technologies that we can read in the news on a daily basis: Big Data, Cloud and the Internet of Things. On the technical side there are three main drivers. Digitization and the triumph of smartphones have led to ever more compact and at the same time more cost-effective computing power – in addition to sensors and cameras, which are also declining in price, but more sophisticated. The increasing competition between established and new players is currently leading to more and more AI-specific chip innovations. In 2008, the world's first single-teraflop supercomputer cost USD 100 million and filled an entire room. Nvidia's Titan V, launched in 2017, is an AI processor chip with a capacity of 110 teraflops. AI systems live on data. The more data an algorithm can analyze, the better it can recognize and understand patterns. The still growing spread of mobile devices, the progress of the Internet of Things or the beginning use of self-propelled cars, will massively increase the amount of available digital data. The algorithms used today for speech recognition and natural language translation have evolved remarkably over the last decade: What used to take weeks with a previous algorithm is now often solved within hours with new statistical models, neural network designs and learning methods. 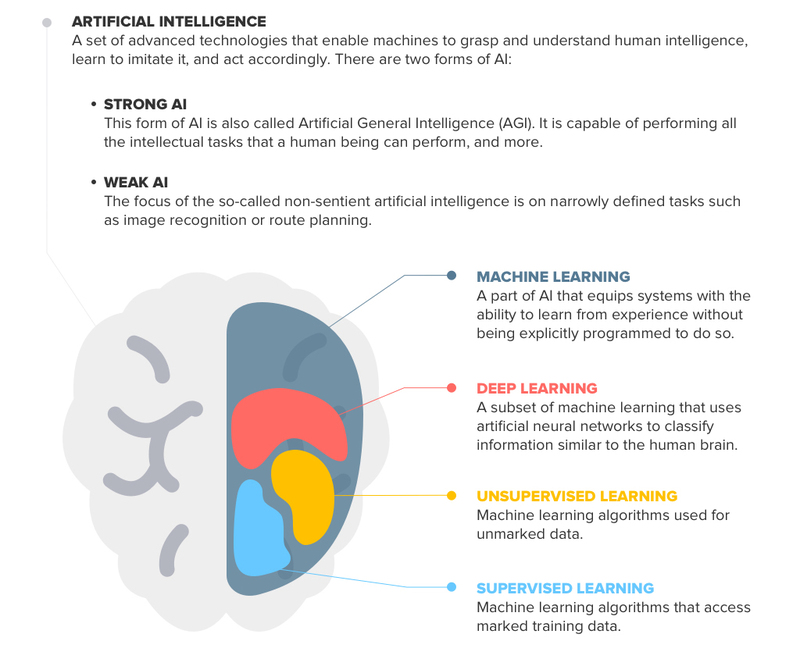 WHAT IS TRENDING IN THE AI WORLD? 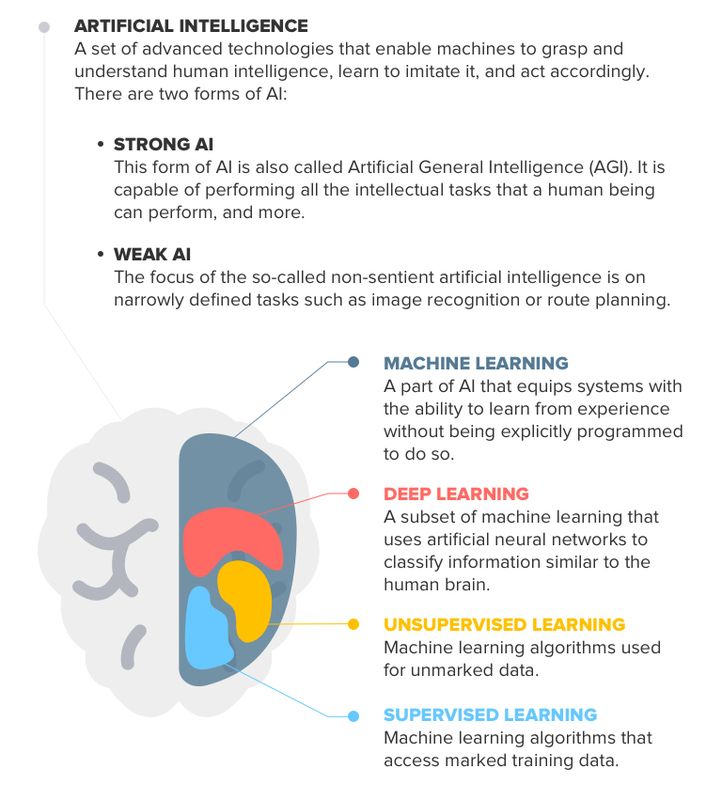 Here's an overview and illustration of the relevant trends around Artificial Intelligence, based on their appearance in trade media, mass media, patents and scientific publications. The arrow implies a typical trend development and life-cycle from a small and growing trend - one that is only discussed in a relatively low number of expert articles and scientific publications - to a bigger, established trend with stagnating growth - which has long been discussed widely within all sorts of media, having moved from niche expert circles into the mainstream. Innovative technologies open up new potential for Artificial Intelligence. Edge computing tools that reduce latency and other AI-specific hardware will create a variety of new products and services for Mobile Computing, IoT and Human Machine Interfaces and improve data protection, security and performance of autonomous system. Virtual reality shopping is giving consumers the convenience of online shopping and the experience of being in a store at the same time – in order to experience stores, products and service in a whole new way. With the help of VR or AR applications customers will be able to try and test products – at home or in-store – more easily, and in a more personalized or gamified manner. Virtual reality technology will play a secondary role, while augmented reality apps will continue being the forefront, according to Stewart Rogers, author and analyst at VentureBeat. In his opinion, "dealers who don't discover mobile AR for themselves within the next six months will lose ground". In 2018, the market volume of AI, which is used in the area of computer vision, was USD 3.62 billion. Current projections have led researchers at MarketsandMarkets to predict that this figure will rise to USD 23 billion by 2023. In 2017, it took DeepMind’s AlphaZero AI only 24 hours, to learn chess, shogi and go without human input on a level that not even humans can reach. Mythic has developed a deep learning inference model. It is based on digital and analog calculations and is able to eliminate expensive processors while extending battery life by a factor of 50 (or more). The dimensions that this new design enables: Essential high-end desktop GPU compute functions can be handled by a module the size of a shirt button that can run for years like the performance of a watch battery. A concrete application of AI can be found in the Signall Sign Language solution from SignAll, the world's first automated translation solution for sign language. The product is based on Computer Vision and NLP. The prototype is currently capable of translating part of an ASL user's vocabulary and generating text from the user's hands and gestures. We are in a phase of digital transformation in which data not only accelerates decision-making processes, but also forms the basis for future decisions with the help of predictive analytics. Companies across multiple industries are using AI-as-a-Service solutions from both established vendors and start-ups and increasingly purchasing "out-of-the-box" AI-based enterprise tools to obtain Amazon-like personalization, Google-like search mechanisms, and IBM Watson-like predictive capabilities. was just USD 3.49 billion. Dynamic Yield provides an end-to-end enterprise platform for personalization. It leverages an organization's existing customer data with additional data sources to create accurate and detailed customer profiles. The platform is used by more than 220 brands worldwide who want to take their personalization capabilities to a similar level as Amazon. Google is also working to simplify the use of AI. With Google's Cloud AutoML, companies with limited expertise can create customized machine learning models with their own data and labels without writing a single line of code. Human-machine interfaces are on their way to becoming more and more natural and to replace smartphones or tablets; "How Smart Speakers stole the show from Smartphones" was the Guardian's headline on this topic at the beginning of 2018. Tech giants in particular, but also newcomers are competing to be the developers of the "next platform". They use AI to increase the intuitiveness and intelligence of existing and new interfaces. Conversational user interfaces – especially voice-activated solutions – have experienced a massive increase in media attention and consumer acceptance in recent years, due to improved processing and understanding of natural language. However, progress is also being made in the area of emotionally intelligent and empathetic AI, which means that more and more home robots can be developed. One example is Amazon, which plans to launch its first home robot in 2019. Every year the number of Smart Speaker users increases. The annual growth in the US is 48 percent – for 2018 this means an increase of around 90 million users. The result of the Salesforce study "State of the Connected Consumer" fits in well with this. According to this study, more than one in two consumers (57 percent) expects smart assistants to have a strong or moderate impact on their lives by 2020. A very well-known example of the use of AI-supported voice-controlled interfaces is Google Duplex, which arranged a hairdresser appointment for a customer in a lifelike telephone call during I/O 2018. Xiaoice (pronounced Shao-ice) from Microsoft has also made it to a similar fame. The chatbot has 500 million followers, who can interact with Xiaoice. In addition to text chats, she is also capable of telephone conversations. Olly, on the other hand, is the first home robot with an evolving personality that adapts to each individual user. This brain-inspired AI system, developed by Emotech's leading AI researchers and neuroscientists, is therefore capable of more than just executing commands. Artificial Intelligence is well on the way to automating cognitive tasks in addition to repetitive manual tasks. Today, autonomous systems are not only used in factories, but more and more on our roads, in the air, on the water and in offices. Today, advanced AI-based systems are driving preventive plant maintenance and the optimization and automation of supply chain operations. And increasingly sophisticated and diverse robotic process automation tools are helping to automate everyday rule-based business processes, allowing companies to spend more time on higher-value work. According to Elon Musk, founder and CEO of Tesla, road traffic will also experience a revolution: "I think we will see how autonomy and artificial intelligence advance tremendously. My guess is that in probably ten years it will be very unusual for cars to be built that are not fully autonomous", says Musk. Toyota sees enormous potential in self-driving cars and invested $500 million in this division at Uber, Reuters announced in mid-2018. 50 percent of all current work can be automated using existing technologies, predicts McKinsey in his November 2017 "Jobs lost, Jobs gained" report. UIPath develops a platform that enables the automation of robotic processes without specific know-how. The company thus offers development tools for the automation of complex processes in cloud or on-premise versions. The platform allows several robots to run on a single virtual machine. Reuters relies on AI for journalism: Lynx Insight. The tool will help journalists analyze data, tell stories and even write sentences. This is not to replace reporters, but to support them with a digital assistant instead. Lynx Insight, which has been tested by dozens of journalists since the summer, is now being introduced to Reuters editorial staff. Predictive analytics will have a massive impact on the condition of machinery and equipment. By combining sensors, IoT platforms and AI-controlled analysis tools, companies will not only be able to monitor their equipment, but also predict failures and outages. Enhanced interfaces will increasingly close the gap in Artificial Intelligence between IQ-intensive interactions and EQ-driven experiences, allowing brands to engage with customers at a much deeper, personalised level. Thanks to breakthrough advances in computer vision, computers can recognise things faster and see differences that people can't see. Businesses can use these features to gain better insight into consumers or analyse vast amounts of visual data. Chatbots for customer service, AI process automation, and AI-driven decision making reduce the effort required for more everyday cognitive tasks. This allows employees and organizations to focus more on higher-value tasks and work that requires more imagination or creativity. We are at a time when Artificial Intelligence is entering our everyday lives and the world of work at a rapid pace – some progress is happening so fast that we can hardly imagine things that will be possible tomorrow. Start into the AI age together with Reply or get Reply on board to take your Artificial Intelligence to the next level. Take a look at our range of services! SONAR is an innovative, Data-as-a-Service Tool for quantified foresight. It recognizes, compares and analyzes existing trends, and identifies new developments in real-time.